Product #1492 | SKU VHUBUV/IF/SDI | 0.0 (no ratings yet) Thanks for your rating! The Blackmagic Design Universal Videohub SDI Interface includes 4 SDI inputs and 4 SDI outputs, plus 4 deck control. In addition, it comes with full re-clocking and auto switching SD, HD, and 3 Gb/s SDI (serial digital interface). 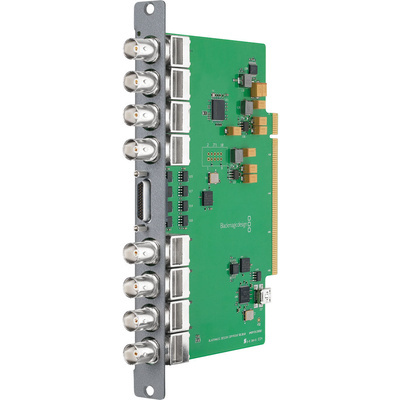 The SDI interface connects all devices in a facility by covering long distances up to 91.4 m. It uses 10-bit video quantising that allows 1024 video levels, and eliminates banding and contouring problems in high quality video.